I am a new enough blogger that receiving a tag like this is super exciting! My dear friend Audrey of Le Vernis Chocolat tagged me with this award and I am now playing it forward!! 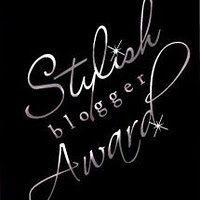 Copy the award above, place it on your blog - link your blog back to me and name five things about yourself! 2. I turned 30 this year in March and it is just now starting to freak me out. AND my seven year wedding anniversary is coming up in November... I am offically an adult, but I don't wanna be! In my head, I am still in college. 3. Speaking of college, I graduated from the University of Colorado at Boulder with a degree in Classics. Yep, Greek and Roman history, language, and arts. Four years of Latin and I don't remember anything. 4. I am crazy shy and outrageously outgoing at the same time. It goes in phases. 5. I talk to people for 10 hours strait while at work. When I come home I appreciate silence.